A question that I get time and time again (I’m talking in almost every single training class) is “How do I get my dog to stop pulling on-leash?” Although loose-leash walking always requires some training, having the right equipment is a good place to start. For many people, however, having a good harness is all it takes for their dog to walk politely while on-leash and it does not take much further training. The right equipment to have, in this case, is a front-attaching harness. There are many different brands and varieties of these, but what they all have in common is that the leash clips in front, on the dog’s chest, rather than on the back. Okay, So Why Does it Work? Front-attaching harnesses help because they work with the dog’s opposition reflex, meaning that when dogs are pulled one way, they will naturally try to pull the opposite direction. Picture a dog straining at the end of the leash with the leash clipped to the collar: the leash pulls them by the back of their neck, meaning that dogs automatically pull the opposite way- i.e., forward, and against you. If you think about traditional harnesses where you clip the leash on the dog’s back, these also pose a problem because the leash is pulling backwards against the dog, causing them to pull forward the opposite way. For this reason, traditional harnesses actually encourage pulling on the leash, contrary to the popular belief that they make dogs easier to handle. This is why sled dogs wear harnesses that attach on their backs: they use this leverage to actually pull with more strength. This explains a lot, doesn’t it? This is where front-attaching harnesses come into the picture. When a dog wearing a front-attaching harness pulls hard enough, they actually get turned around to be facing you rather than becoming able to pull harder. Additionally, when they pull they feel pressure from the strap across their back and move into that pressure. This teaches them to walk by your side rather than pulling, because pulling no longer works! An added bonus: front-clipping harnesses will not harm your dog. Strong pullers, when using a normal collar for walking, can injure their trachea because of all the pressure that is put on it. Front-attaching harnesses will help save your dog’s trachea. One other piece of equipment that encourages pulling is the ever-popular extendable leash. This tool makes pulling worse because dogs learn that pulling on the leash works. Just think about it: when they want to go somewhere, they simply walk that direction and are reinforced for their pulling. Then, when they switch to a normal leash, they continue to pull because they learned before that it works to get them where they want to go. Not to mention that accidents can easily happen when using extendable leashes because of faulty lock settings: the locks on these leashes can easily break, either from malfunction or from a strong dog pulling too hard. Save yourself some trouble and just use a normal leash for walking your dog. Plant your feet and stop walking; your dog needs to learn that pulling doesn’t work. Do something to get their attention: you can either smooch your lips, or tap your thigh twice. Whatever you do, you will want to keep it consistent. As soon as your dog looks at you and you feel slack in the leash, either praise or click, and give a treat. Then, continue walking until they pull again. If you do this, and give treats when your dog is walking nicely, they will soon learn that pulling gets them nowhere and that they get rewarded for loose-leash walking! 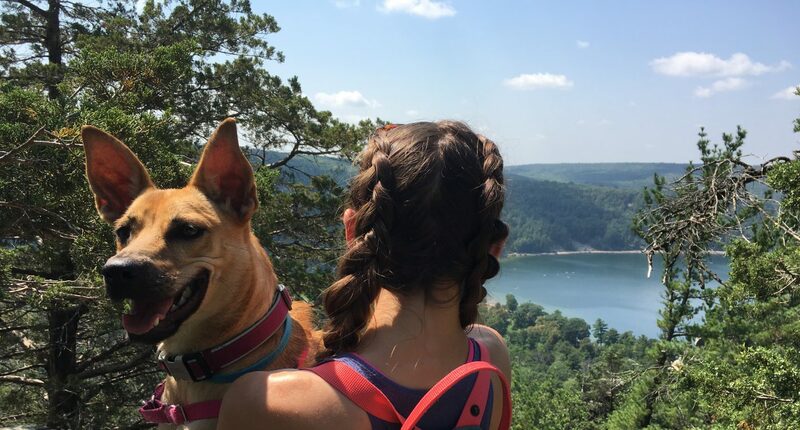 When I first adopted my dog in July, she was an incredibly strong puller while on-leash. In fact, when we first met her, she basically dragged the shelter worker down the hallway; we could hear her wheezing from down the hall because she was practically choking herself. The first thing that we bought her was an Easy Walk harness, and sure enough, that did the trick. It took her a little time to get used to it and realize that she couldn’t pull anymore, but after a few weeks she became a pro at loose-leash walking. Though we also did some training to make her even better, just the harness itself made all the difference in the world. I can’t imagine how much more stressful our walks would be without it! Sasha models her Easy Walk harness. The harness is true to its name- it really does make our walks easy!